Flower & Horse in Spring serve Yunnan cuisine. 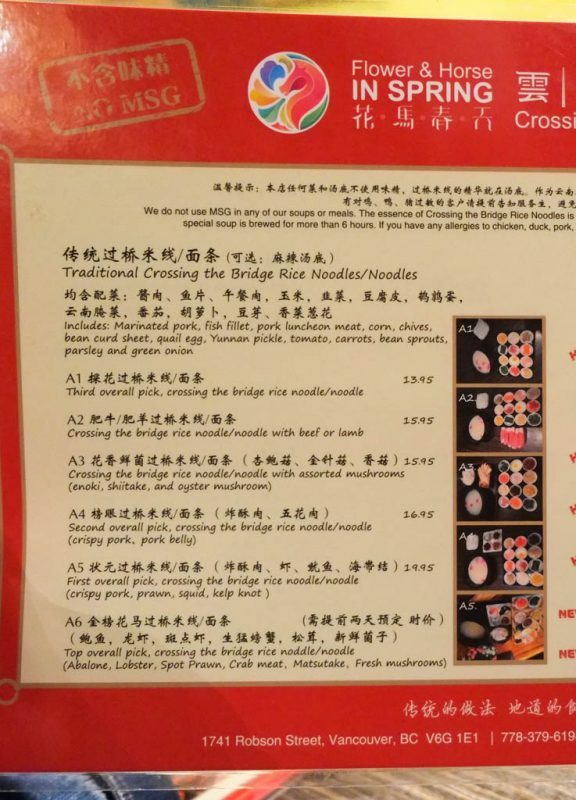 They specialize in a dish called “Crossing the Bridge Rice Noodles”. 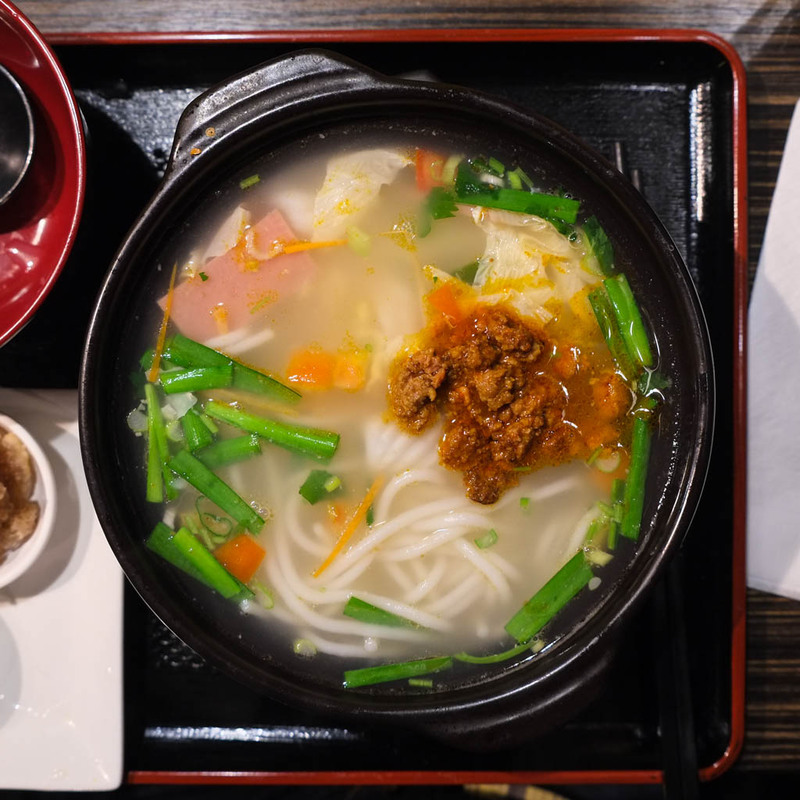 This dish is basically an un-assembled rice noodle soup dish. 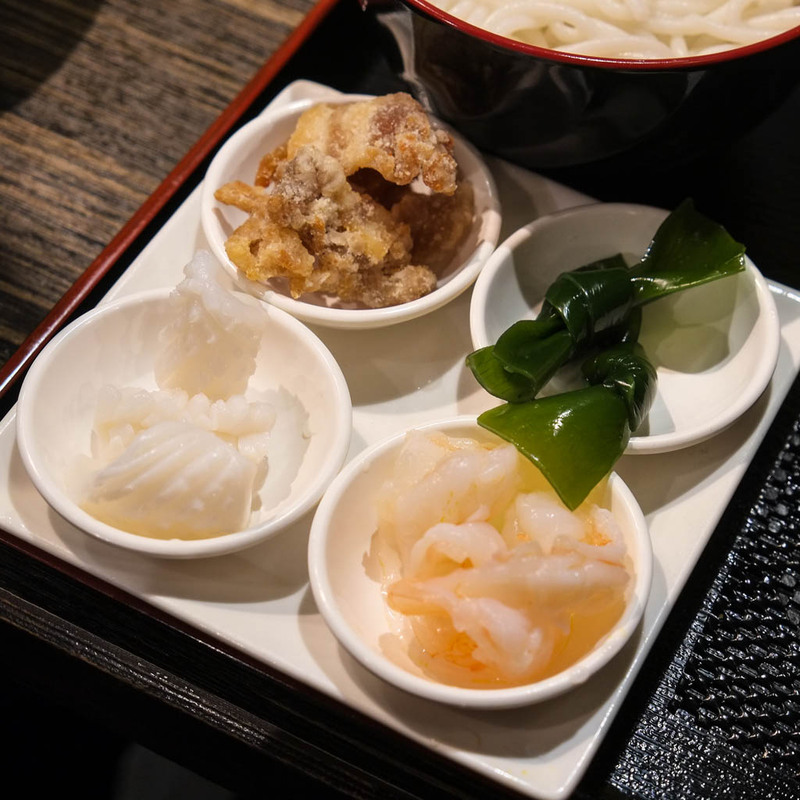 They also have pre-combined rice noodle dishes too. View of the front windows. 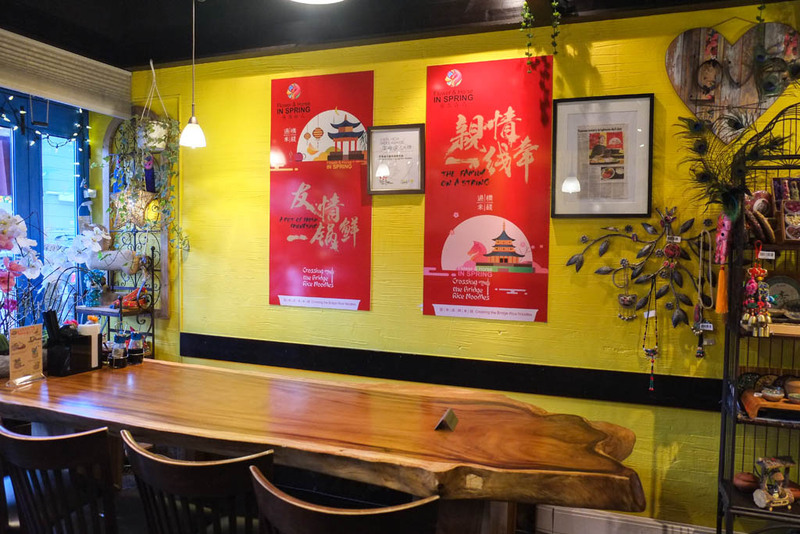 Remind you of Benkei Ramen? The night we were there, the front table was reserved. 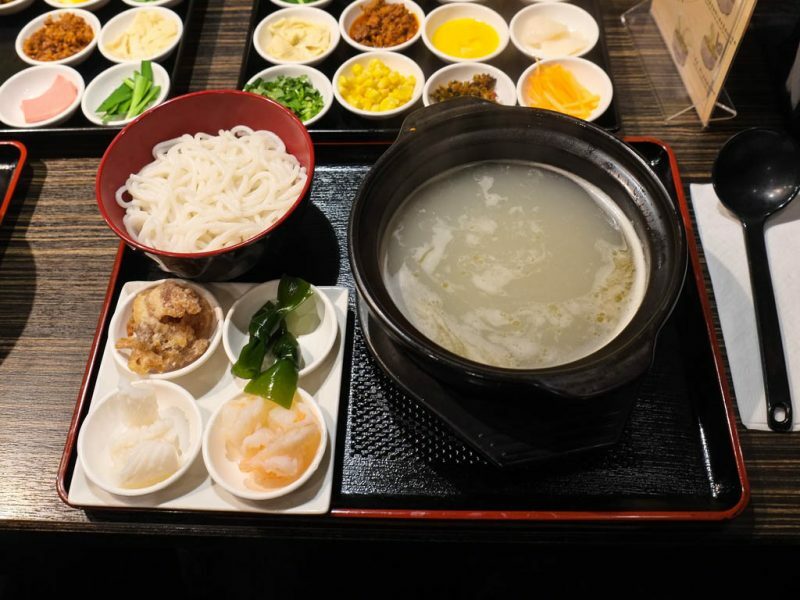 We later saw a family eating the full-on group hot pot option from the menu. 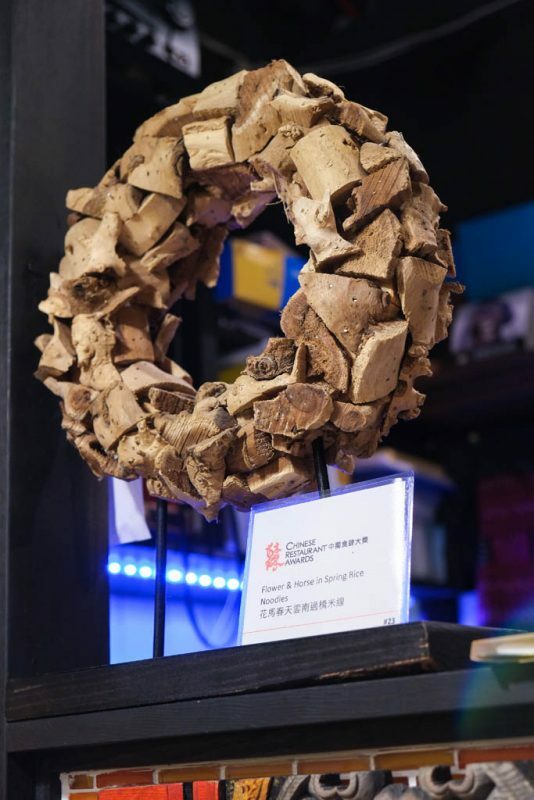 Their award. Reminds me of the “ball of shoes” from Shaolin Soccer. You may be overwhelmed and confused when the food hits the table. Luckily there’s a guide that explains what to do. 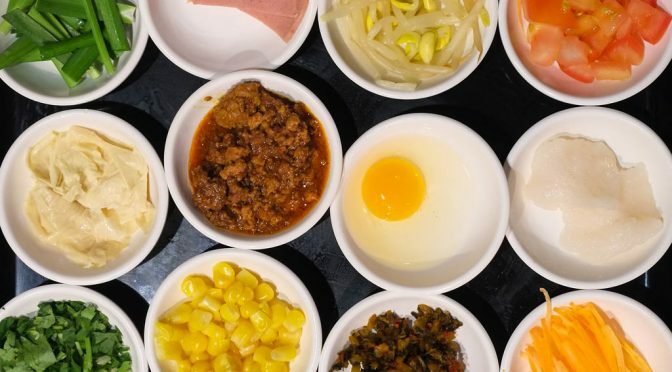 Beat the quail egg, dip your raw meat in it, cook it for 20 seconds, cook your cooked meat for 18 seconds (omg how precise), then chuck in the rest. 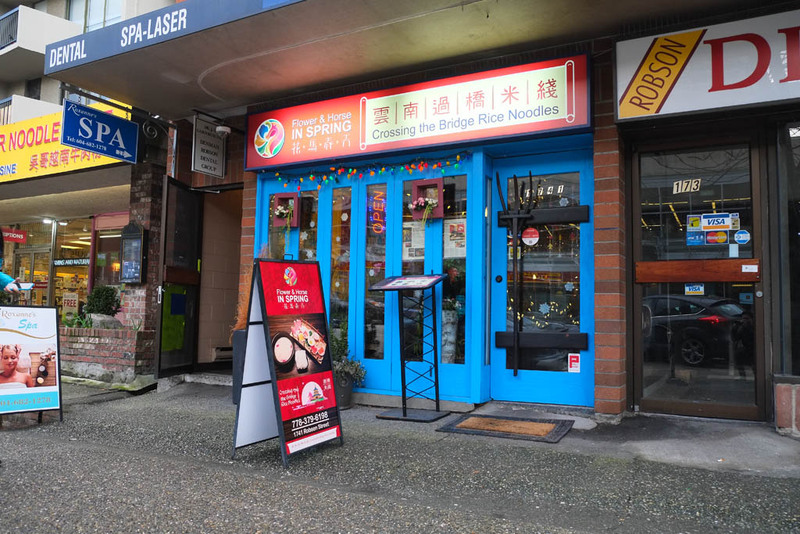 The story behind the Crossing the Bridge Rice Noodles. 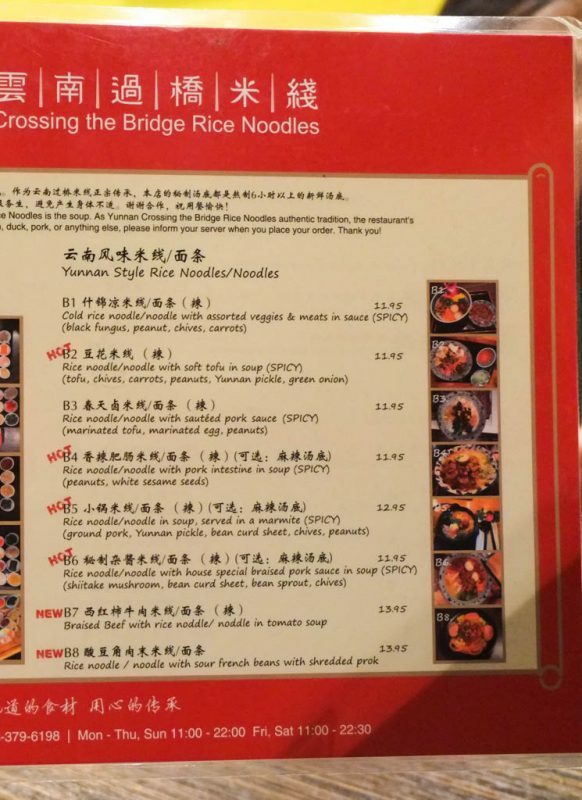 This side of the menu shows their Crossing the Bridge Rice Noodles. The price isn’t listed for the A6 option. 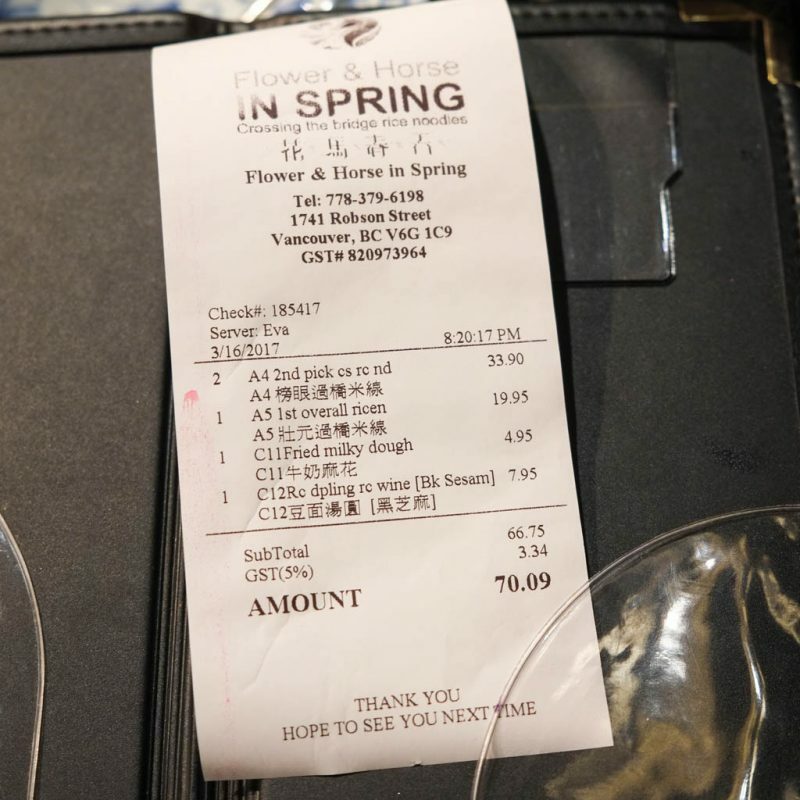 Since it contains abalone, lobster, spot prawns, crab, matsutake mushrooms, and other wild mushrooms, I assume that it would be “market price”. 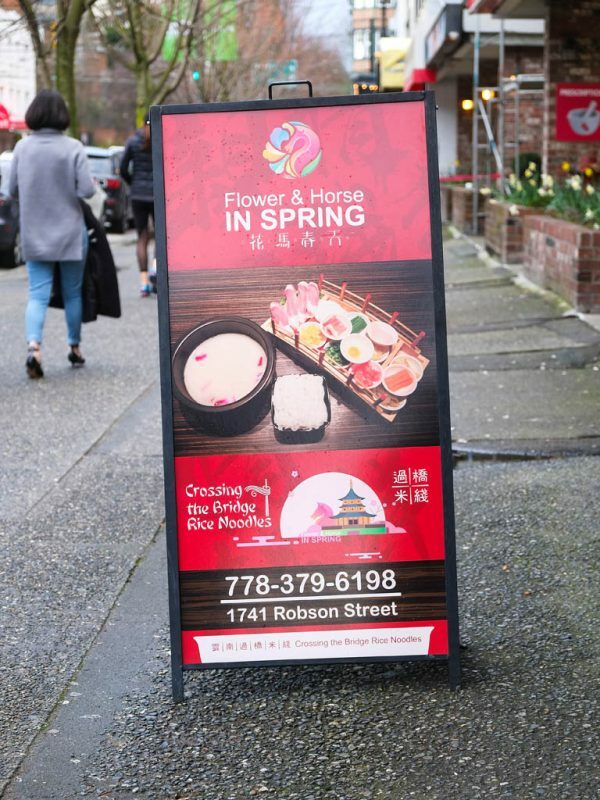 I wonder how they deal with the fact that spot prawns are only available a few weeks out of the year? I noticed afterwards that the menu says “rice noodles/noodles”. We all were served rice noodles by default. I’m not sure what the alternate noodles are, if in fact there are alternate noodles. Right side of the menu showing pre-mixed spicy noodles. 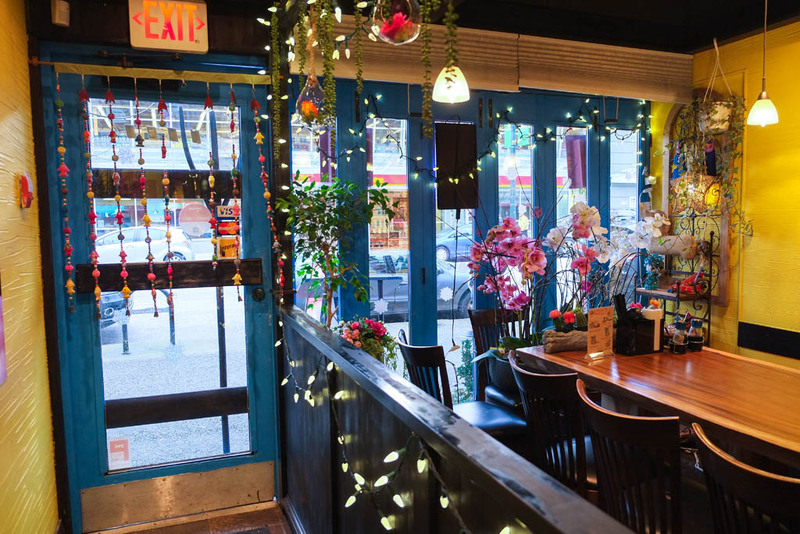 We all had a pretty good experience here, so I’d be down for something from this section of the menu next time. Aside from the usual Asian restaurant misspellings (“prok”), the B5 option references “a marmite”. It’s not a reference to the British/Australian/Kiwi marmite spread. I think it’s the name of the pot they serve it in. Also, we noted the inconsistently applied “(SPICY)” notation and “HOT” stamp. 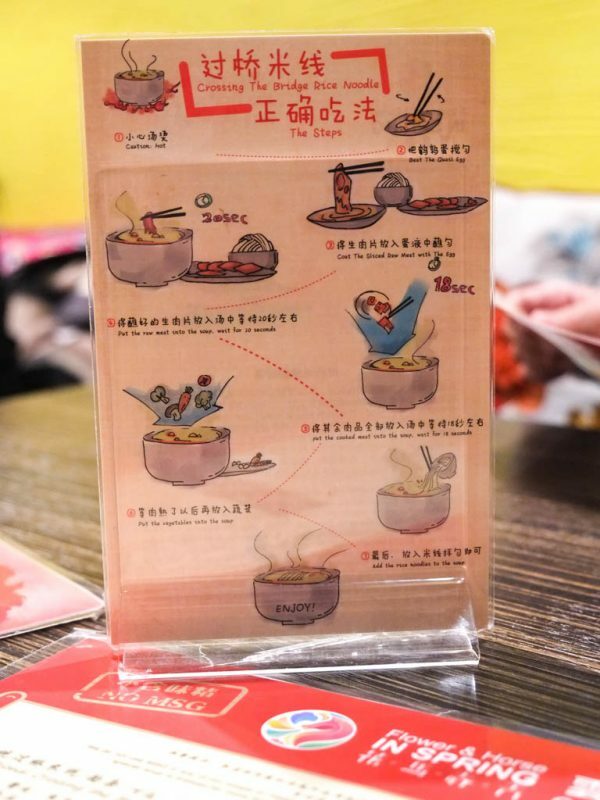 We thought “HOT” meant that the dish is served hot (as opposed to cold), but I thought it odd that marinated pig’s ears are being served hot (see sides menu below). I’ll have to clarify next time. 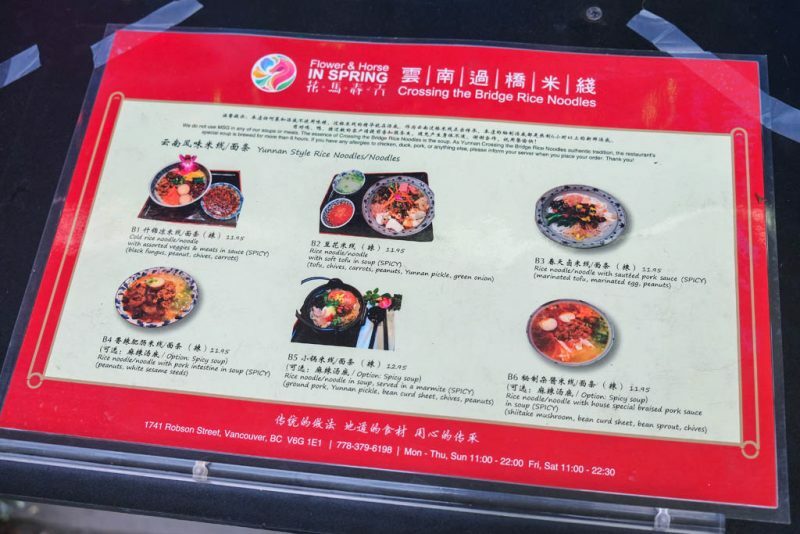 Other side of the menu with bigger hot pot options, drinks, side dishes, and desserts. 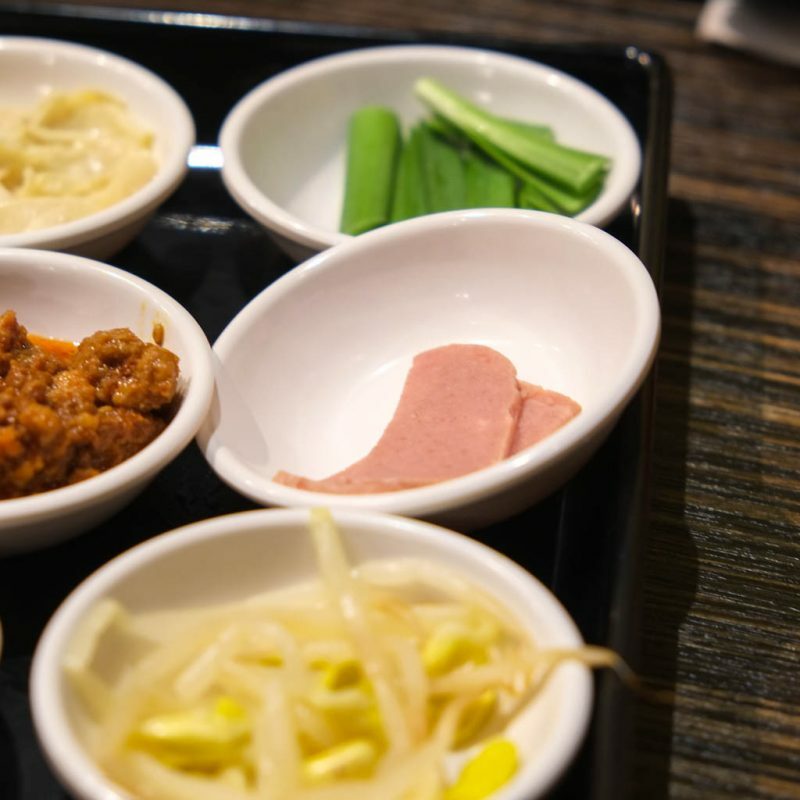 I’d be curious to try some of their savoury meat side dishes next time. 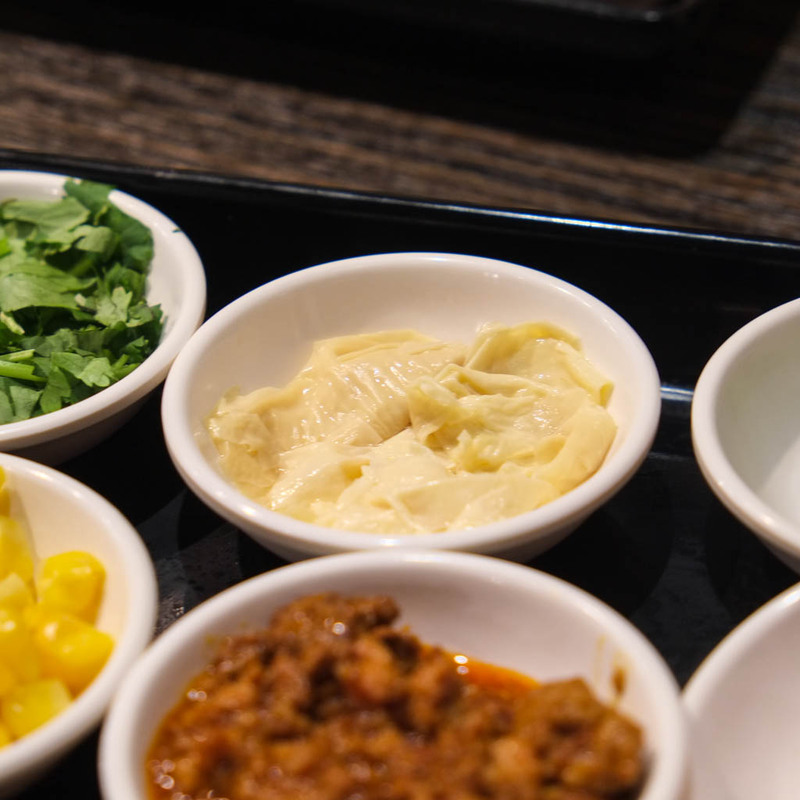 The self-serve condiment station. 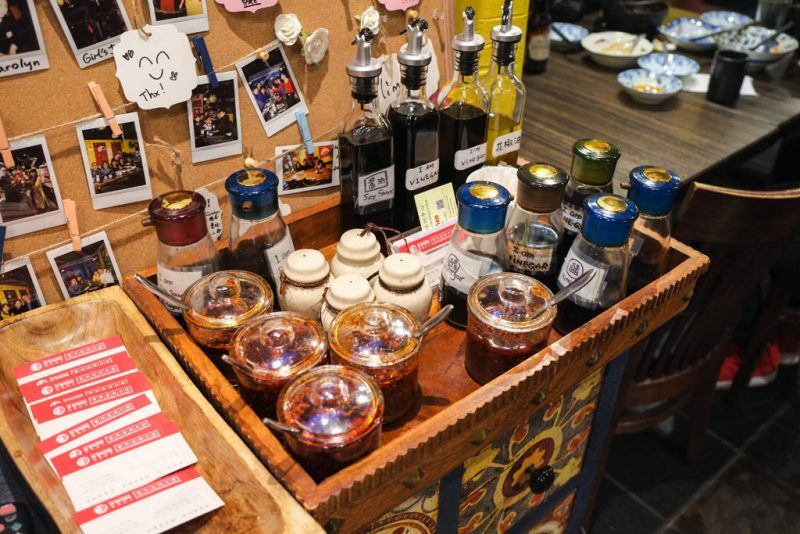 The bottles are helpfully labelled “I’m Vinegar”, “I Am Soy Sauce”, etc 😀 Chili sauce and shakers of salt available too. You’ve probably seen this mise en place on Instagram. It’s hard to miss. 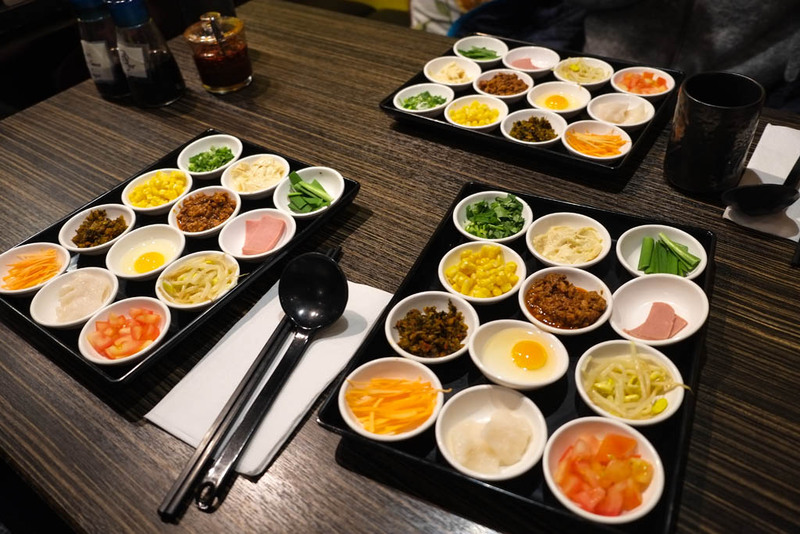 The Crossing the Bridge Rice Noodles come with all the toppings separated out into little dishes. We ordered the A4 and A5 options, and it looks like all the options come with the same basic 12 toppings. 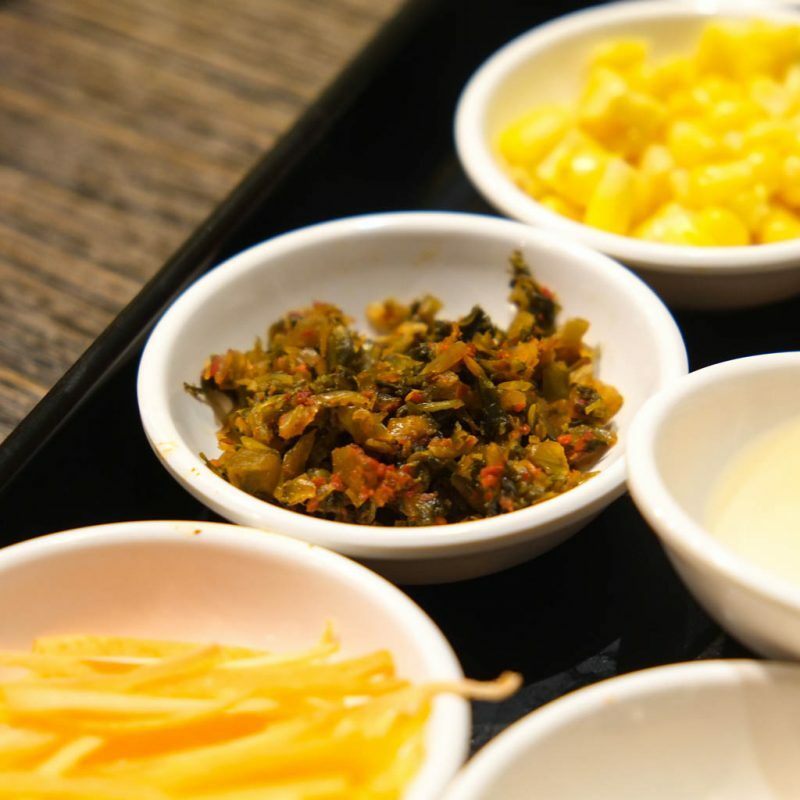 Let’s talk about some of the more interesting toppings, shall we? Spicy ground pork mixture. I put half of it into my soup because I wanted to enjoy some of it on its own. Balance of spicy, savoury, and salty. The heartiest and most punchy of the toppings. A couple slices of fish. Probably sole or basa. I think these were called “Yunnan pickles”. I held off adding these so that I could enjoy the pickled, crunchy, slightly funky flavour. 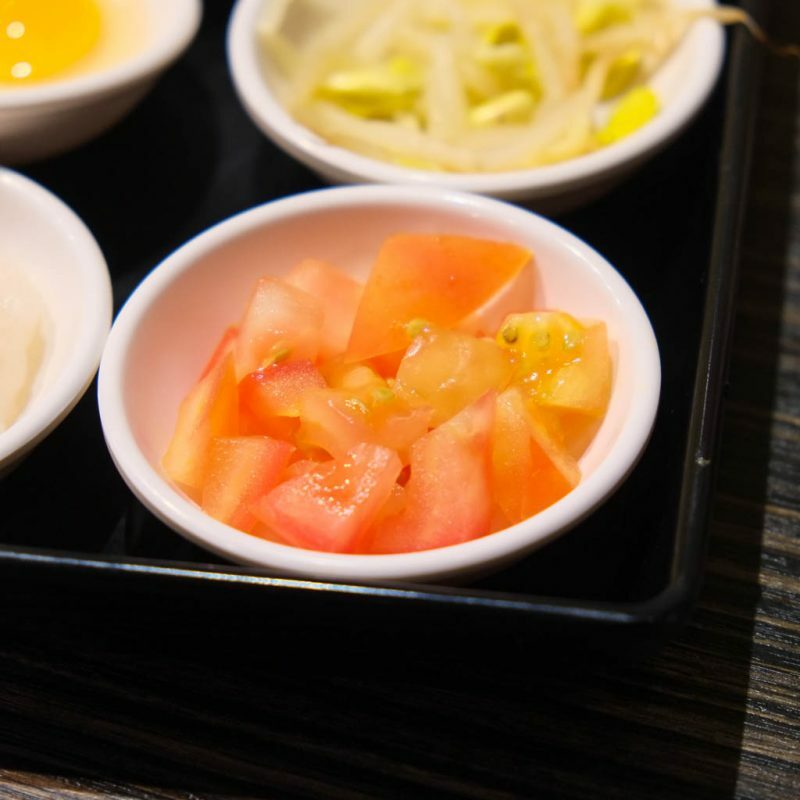 You can find similar pickled vegetables in Taiwanese Meat Sauce on Rice (Lu Rou Fan). Similar but not the same 🙂 Also similar to pickled mustard greens that Cantonese people call mui choy. Once I added some to the soup, the pickliness and funkiness permeated throughout the soup, adding an interesting dimension. I also added a touch of the “I Am Vinegar” bottle to my soup, and that made it sing. Acidity is often overlooked in food. Two slices of luncheon meat-type product. One person in our group rejected it after a bite because they don’t like hot dog, bologna, or Spam-like stuff. 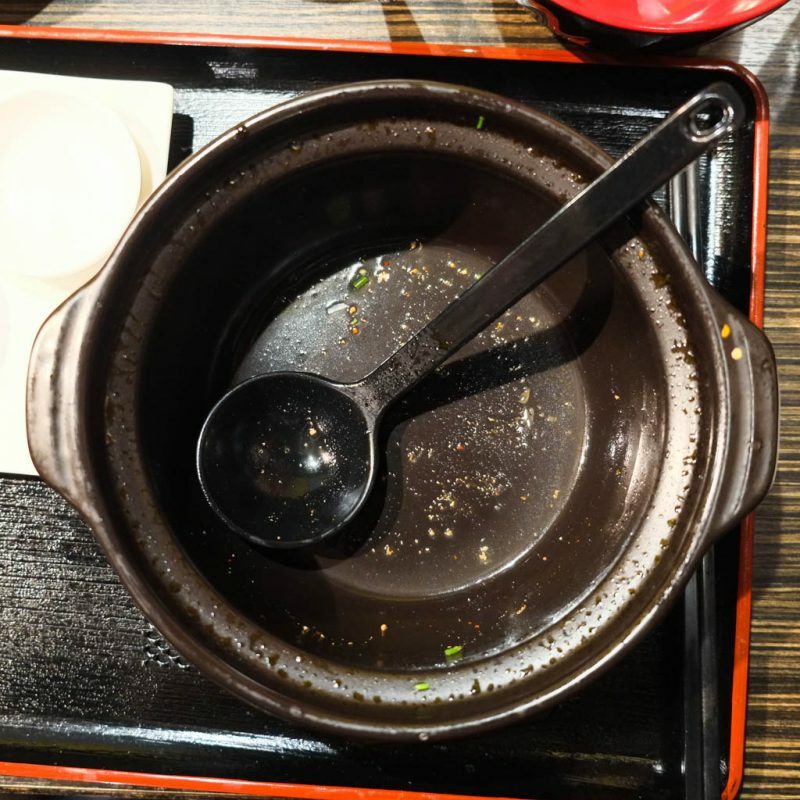 I ate it but I found that it got spongy and waterlogged in the hot soup. 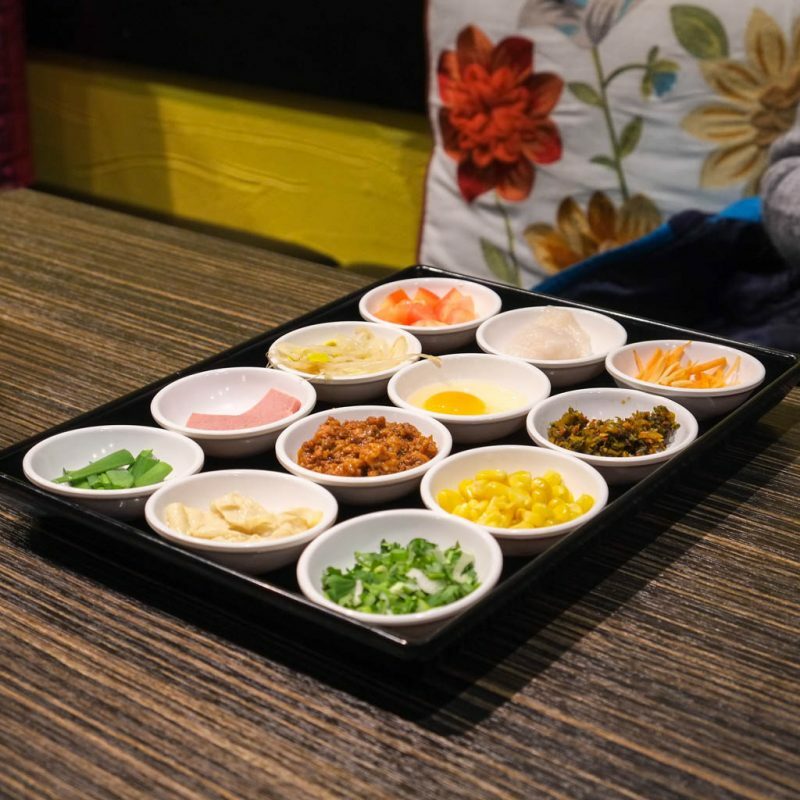 But having all the ingredients separated out means that you can customize your meal and share toppings with others. Industrial tomatoes. But I wouldn’t expect anything more. Tofu sheets. Love the texture of these. 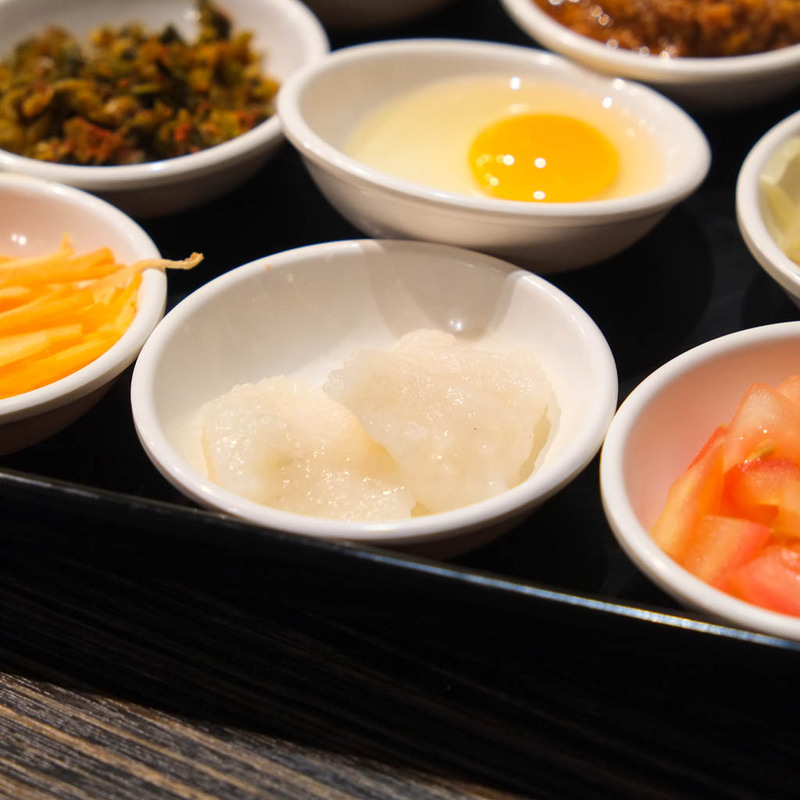 In fact, the toppings as a whole set show a range of tastes and textures. Hot bubbling soup has arrived! 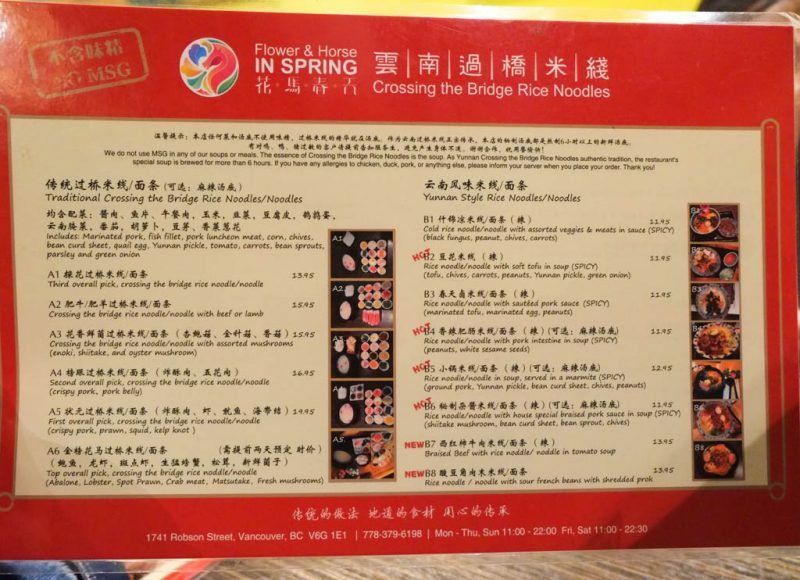 A5 “First Overall Pick” Crossing the Bridge Rice Noodle ($19.95). Once it arrives, work fast! 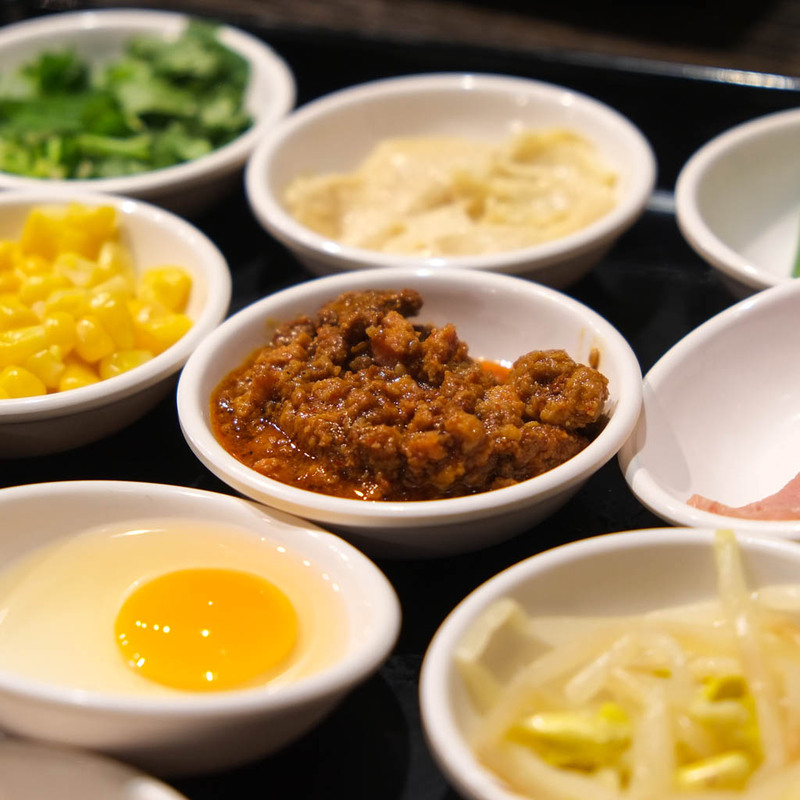 Whatever toppings you want hotter and more cooked, you put them into the pot first (egg, raw meat, etc). Then you add the rest of the stuff in whatever order you want, and add the noodles last. Or you can follow none of this advice and probably come away with a pretty similar eating experience. CRUSHED IT. That cloudy soup is flavourful and has depth to it. 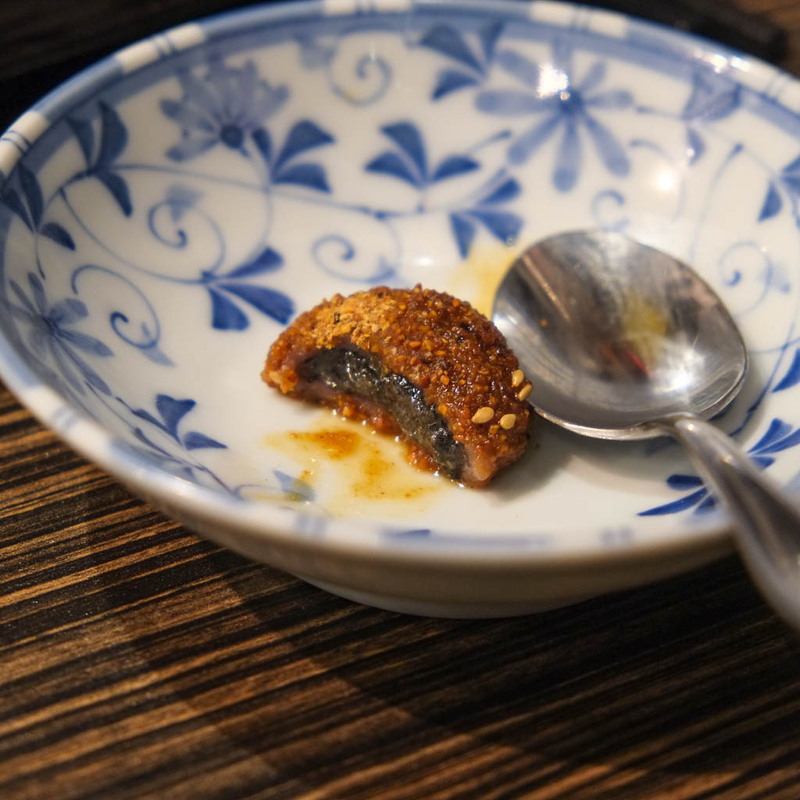 You can really taste the essence of duck — like if you made a soup out of the bones left over from Chinese bbq duck. It’s got a bit of that ducky, smoky quality to it, along with chicken and pork forming the backbone. No MSG, so there’s nowhere to hide. 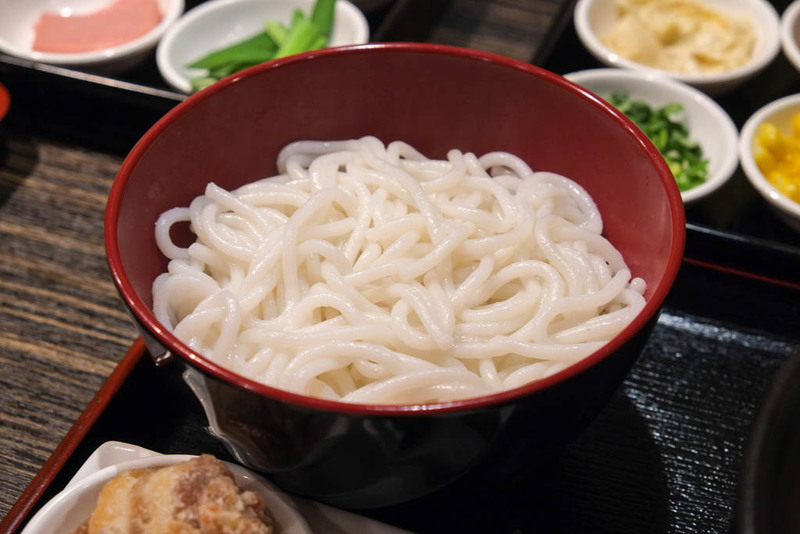 Overall, it’s a light, warm, comforting rice noodle meal. 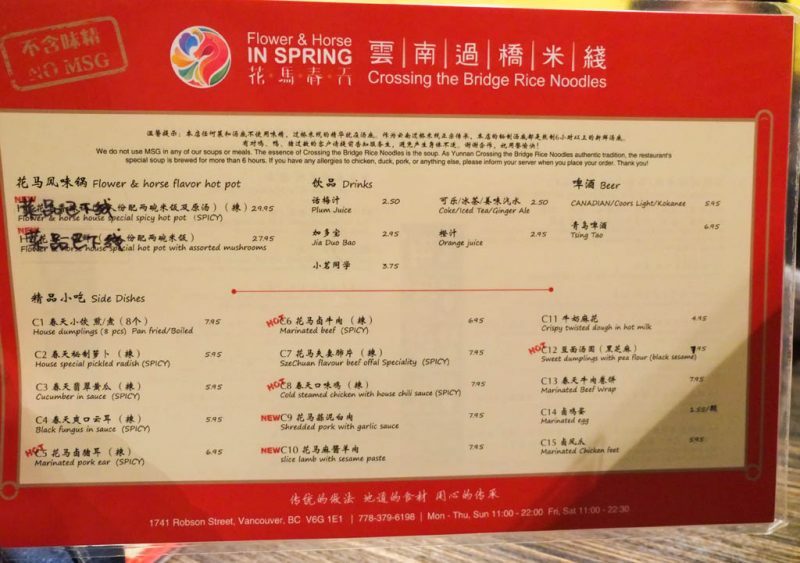 Next time I’ll try some of the pre-mixed spicy noodles from the right-hand column of the menu. I have a feeling I might crave something a bit punchier. 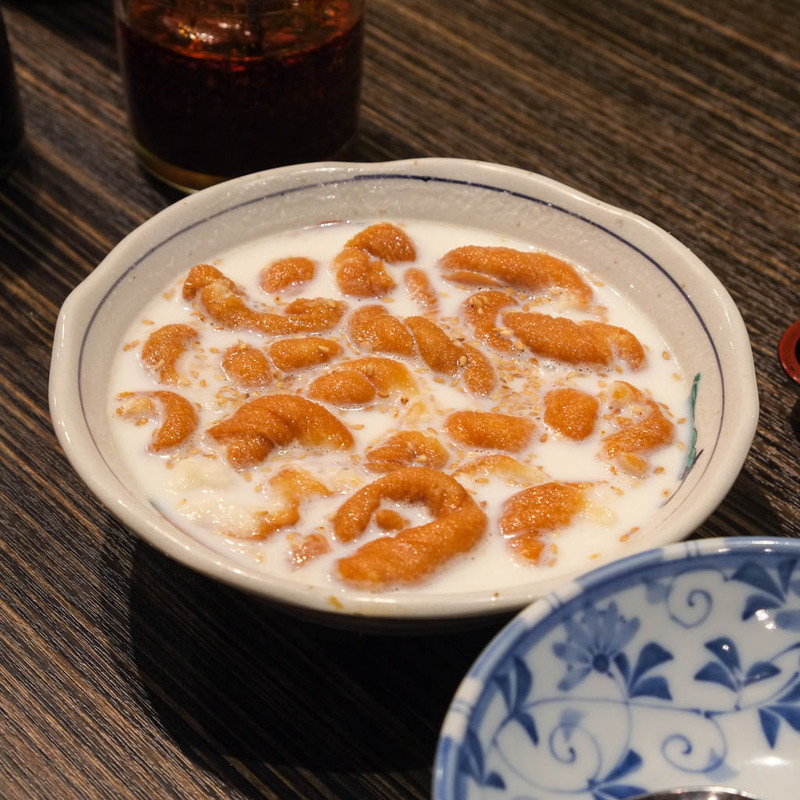 One of two desserts we ordered: C11 – Crispy Twisted Dough in Hot Milk ($4.95). The dough turned out to be the Chinese deep fried pretzel-type things my grandmother used to make called niu gwok (although mahua seems to be the more Google’able name). The slightly sweetened milk tastes like regular cow’s milk (perhaps 1% milk), not soymilk. If you want to experience the crunchy texture of the pretzel pieces, eat this once it hits the table. Good to try once but I wouldn’t get this again. 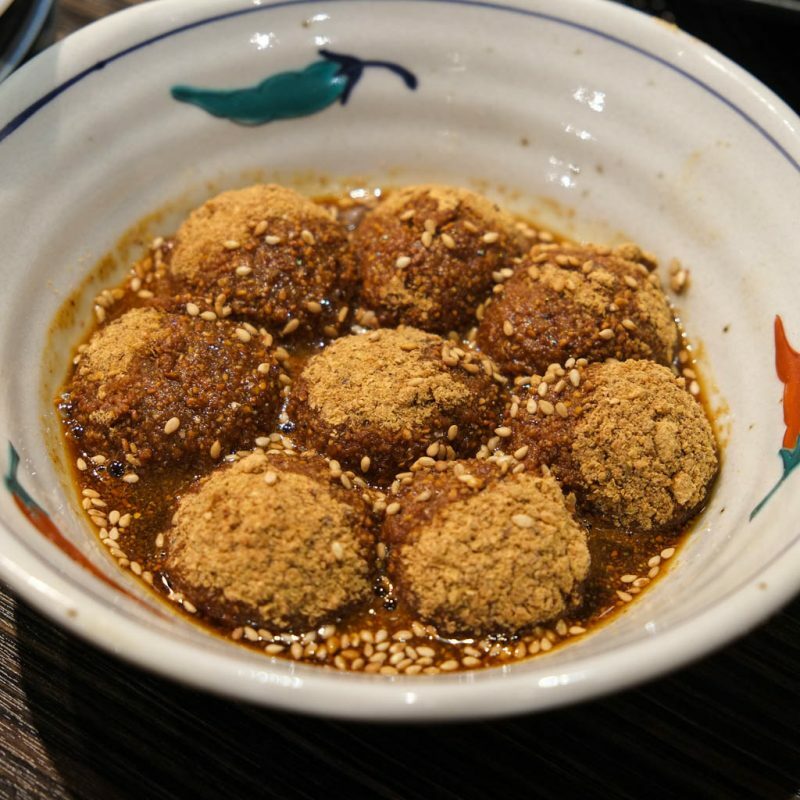 Generous filling and soft yet chewy mochi! 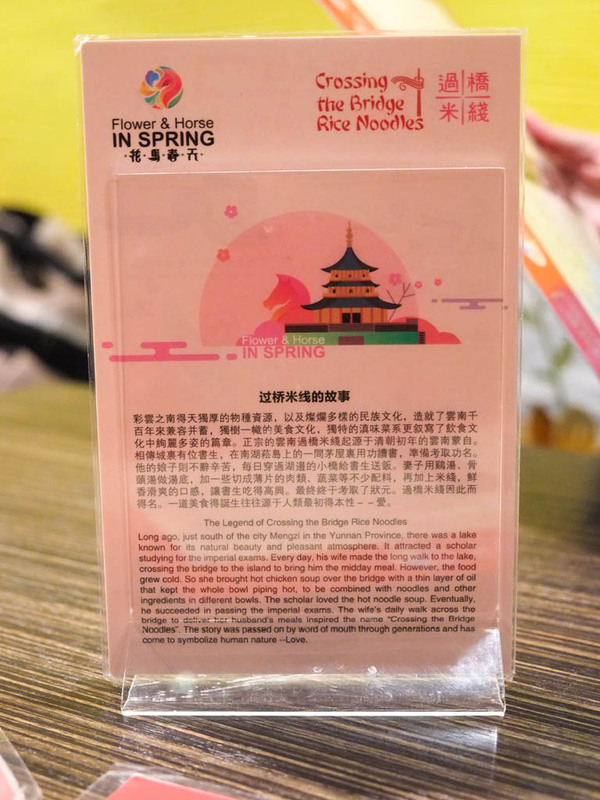 The sugar syrup tasted full and more complex than a simple rock sugar syrup, so I’m 99% sure they use Chinese brown sugar (aka Chinese brick sugar aka bing tong). Sweetness, nuttiness, and a slight caramel quality. Plenty of black sesame flavour. Recommended. My noodles were almost $20 alone, so it’s not as cheap as Chinese food can get, but I was pleased by the experience. 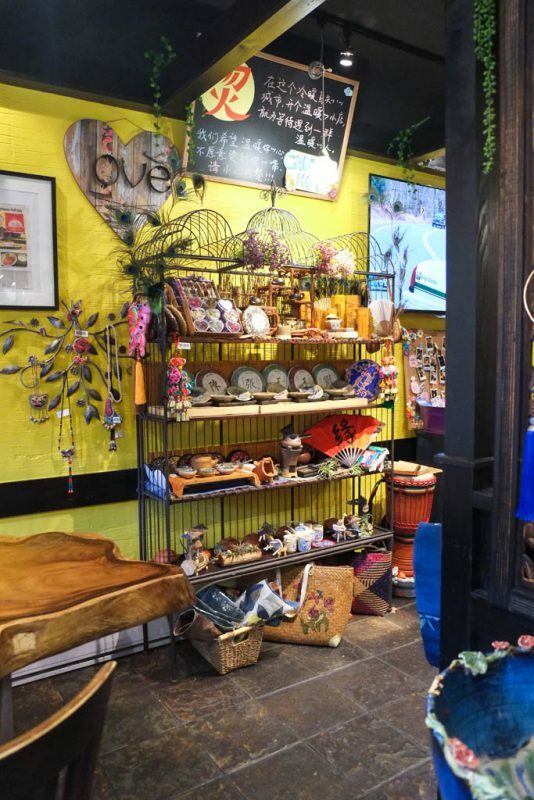 The room is bright and colourful, with plenty of throw pillows and decorations, giving an almost Tibetan/Burmese feeling to the room. I’m looking forward to trying the more spicy and robust side of the menu next time. My second time in a week, so I guess I like it :-). I agree with your assessment of our meal. I tried the right hand column A5 on Tuesday and though I enjoyed it, I think the ones we ordered are the most interesting options here.